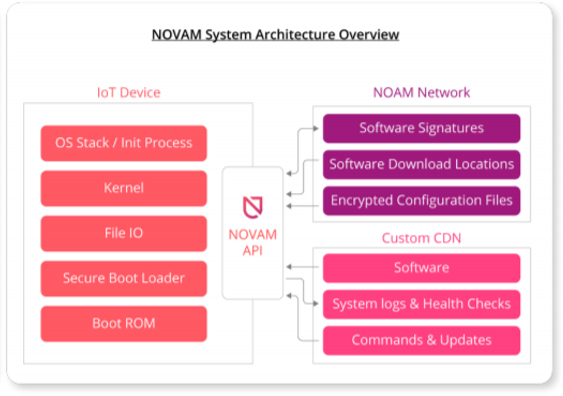 At NOVAM we are revolutionizing the use of the bootloader to establish a root of trust for the firmware and operating system of an IoT device using Blockchain technology. First, we need to understand how existing or traditional architectures work in the boot process. We will apply this technology to the boot process, which is not uniform among IoT devices. 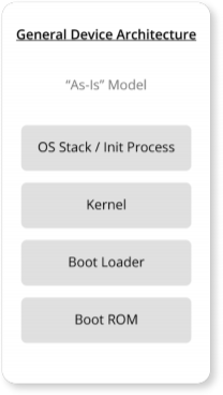 A boot ROM begins the initial boot of the IoT system and looks for the bootloader to pass control and continue with the system initialization. Traditionally this would pass control to the Kernel to allow it to load and continue the process all the way to fully booting the system as seen in the diagram below. In a NOVAM-enabled device, the Bootloader does something different, it reaches out. A NOVAM enabled IoT device wants to know if the hash or signature it has stored on the blockchain is valid and the same as the one computed on the device for the firmware and operating system. The device can initiate this process during a NOVAM health check or using the NOVAM API to reach out to the NOVAM Distributed Ledger (DLT) to determine if the hashes or states match. If they do not, the device begins the NOVAM remediation process, where the device contacts a Content Delivery Network (CDN) to download correct firmware/OS for the affected device. This CDN has securely stored versions of the firmware/OS to allow the process to scale in the case of a massive incident as seen in the diagram below. Through the integration of the NOVAM network, NOVAM API and CDN’s NOVAM is able to create a completely new architecture. This new architecture leverages all of these individual components to allow for a seamless and secure connection of the bootloader to determine the hash or state of the existing IoT device, in addition to reaching out for remediation in the event of an incident. The below diagram shows the tight integration and how NOVAM is different from other IoT security. NOVAM creates a platform that mimics the human immune system and allows for automated remediation of IoT devices from the increasing threat environment that IoT devices live in.